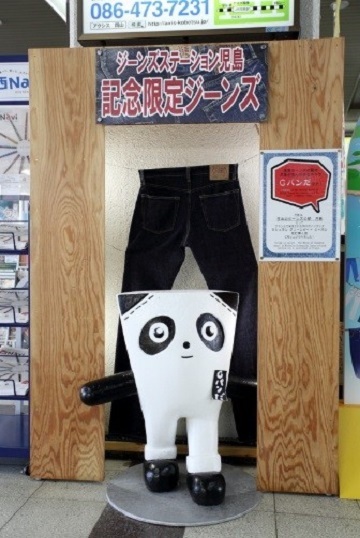 The town of Kojima, located in Okayama prefecture's city of Kurashiki, is the birthplace of "made-in-Japan" jeans. The town's central shopping district, once suffering from a blight of shuttered shops, is now the lively home of "Jeans Street," where more than 140,000 tourists visit annually to shop at more than 30 jeans-related stores. 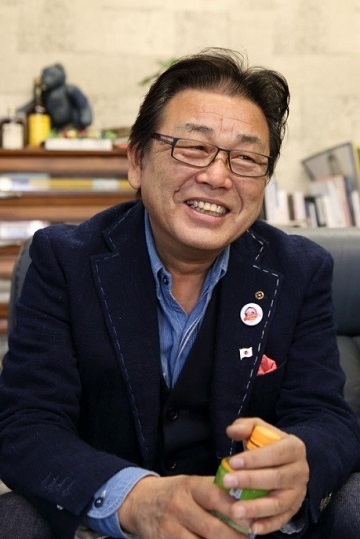 The founding father and advocate of Jeans Street is Manabe Hisao, president of Japan Blue, the company that produces the highly reputed Japanese brand Momotaro Jeans. Manabe talks about his attachment to Kojima, the home ground of his enterprise, and the ideas that have inspired him. 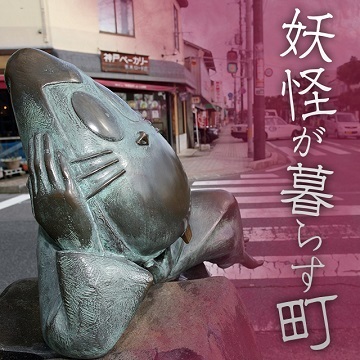 In 2006, I opened a retail shop to sell Momotaro Jeans in the Kojima-Ajino district of Kurashiki. The shops clustered there were once very prosperous, but from around 1990, many were shuttered and business went into decline. 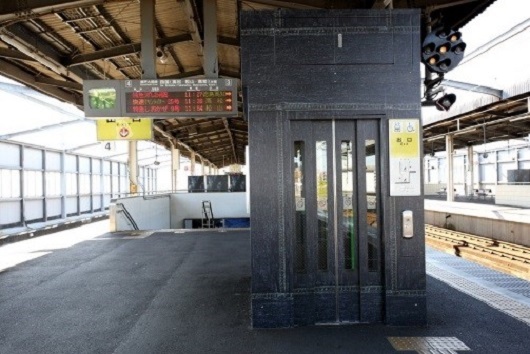 The closing of numerous small family-run shops that once thrived in such shopping centers (shotengai) was widespread in those days, not only in Kojima but many other parts of Japan, and the local government was looking for ideas to deal with the problem. So I suggested to them: why don't we get more jeans shops to open here and promote it as "Jeans Street"? Kojima is an area where cotton cultivation began way back in the Edo period (1603-1867). It was first famous for its production of tabi socks, the toed socks that were standard as long as people wore kimono. In the modern age, after the establishment of the public education system, Kojima rose to the status of top producer of school uniforms, so the textile industry flourished there for a long time. In the 1960s, it was the first area in Japan to begin production of blue jeans. I myself have been involved with denim fabric from early in my career, so it seemed to me that there was no better idea than using jeans to help reinvigorate the local economy. If you have a good idea, it's up to you to put it into action. So first, I presented my idea for the town to the owners of the closed shops. I asked them to rent the shops out cheaply. Then I approached the jeans manufacturers and suggested they open a shop in the district. At first they were incredulous: "What? Why here? Jeans will never sell here." "No one will come to such a place to buy jeans!" But I told them, "you don't know until you try," and that has been my philosophy. Then, since one cannot revive a town by the efforts of one industry alone, I organized a promotional council within the Kojima Chamber of Commerce and got local schools and other organizations to send representatives to join it. After that, I just made the rounds, day after day, trying to persuade the shop owners and jeans makers that my idea would work. I also promoted the idea via the mass media. What you have to do is blow up your idea big! Then the media people will get interested and introduce it for you. If news starts to come out that even the locals don't know, people get intrigued and they start thinking they'll go to check it out. Manufacturers, hearing that sales were growing more than expected, then started showing interest and opening up new shops. The success of the early shops paved the way for those that followed and a favorable cycle started to go into motion. The year after we launched Jeans Street in 2010 with 10 shops, 7 more shops opened. The number has been increasing annually ever since, and now we have more than 30 shops associated with the Jeans Street scheme. They include not only jeans shops but specialty stores for accessories, shirts, and other goods. Sightseeing tours began to put Jeans Street on their itineraries, and soon there were big tour buses bringing people in to shop. 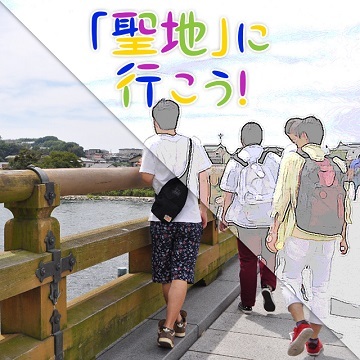 In 2010 there were about 8,000 tourists, but those figures increased to 19,000 in 2011, 50,000 in 2013, and 140,000 in 2014. Recently the shoppers include many tourists from overseas--they make up about 10 percent of the total. 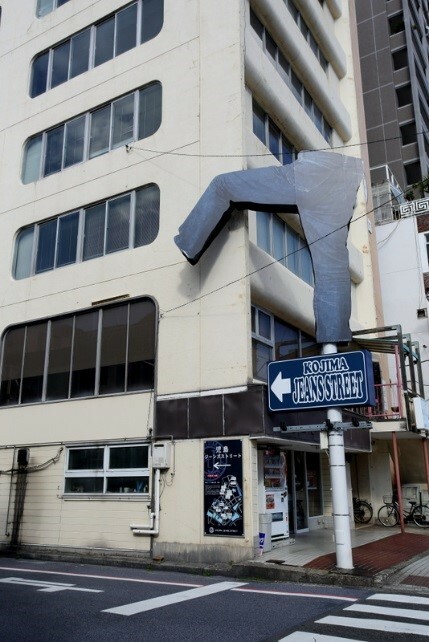 A mammoth pair of jeans strides over the entrance to Kojima Jeans Street. 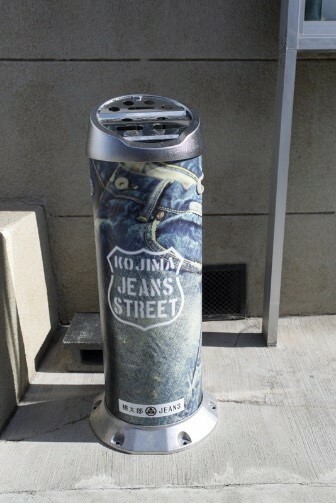 An ashcan for smokers is wrapped with a jeans image. 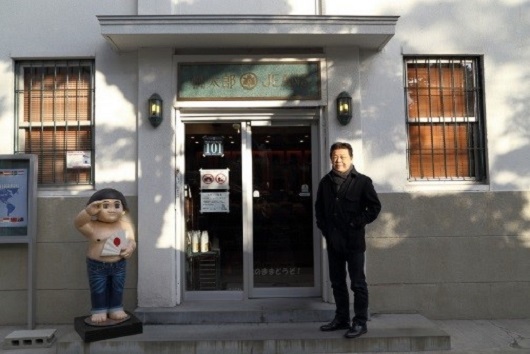 Manabe Hisao standing in front of his Momotaro Jeans shop located at the starting point on Jeans Street. 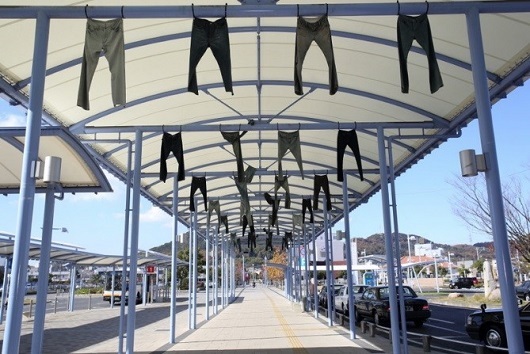 Pairs of jeans hanging from the canopied promenade in front of Kojima Station. When I set out to create Jeans Street, I wanted to make it the best shopping street in Japan, so I looked around at successful examples of shopping streets around the country to see what they were doing right. I learned that it wasn't enough just to open a lot of shops and have people milling about. Inventing a yuru-kyara mascot or local costumed character to represent the location isn't enough either. I realized that we had to have goods that you couldn't get anywhere else and then make it a place that would excite even the fancy of shoppers who are very particular about what they buy--the otaku or mania types. Thanks to the increase in the number of shops, Jeans Street now sells all sorts of quite distinctive types of jeans and also other attractive goods and accessories. You can experience what it is like to do indigo dyeing as well. Eventually, I think it will be possible to have hands-on experiences with every stage of the manufacture of jeans, from the raw cotton to the finished product. My ultimate goal is to put Kojima on the map as the place where Japanese jeans were born. Even should the jeans industry someday vanish from Kojima, it would still be the place people would come to find out where it all began. For example, take Nîmes, the town in southern France from which "denim" (serge de Nimes) takes its name. There is no longer even a textile industry there--just one museum about denim. But those who are really crazy about jeans make pilgrimages there. The city of Cannes, though it has no direct connection to the film industry, is famous because its name is on the famous Cannes Film Festival. That is the way I would like to make Kojima famous. It's not enough just to make high-quality jeans. It is crucial to advertise and make one's idea widely known. Amsterdam, in the Netherlands, sells itself to the world as a jeans-manufacturing city. 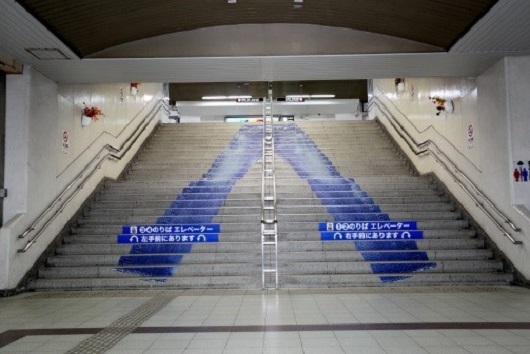 Of course, the jeans industry there is big and great efforts are also put into training people for the industry, but what is really impressive is the way they advertise. So the top jeans brands from around the world have bases there. Since 2014, I have had several interns from the House of Denim Jeans School in Amsterdam working with me. In 2015 we had an exchange in which James Veenhoff, founder of the House of Denim foundation came to visit Kojima. It would be great if it could be said that Amsterdam and Kojima are the two great meccas of the jeans world! I am happy to say that Kojima got a mention in the Michelin Guide in Japan (4th edition) calling it "Japan's jeans capital." That will do wonders for bringing more people to visit. 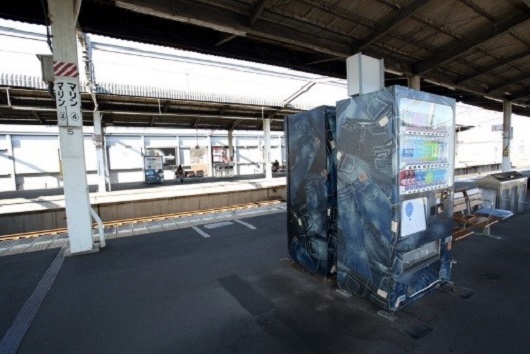 On the platform at Kojima Station, the vending machines (left) and even the elevator are wrapped in a jeans design. 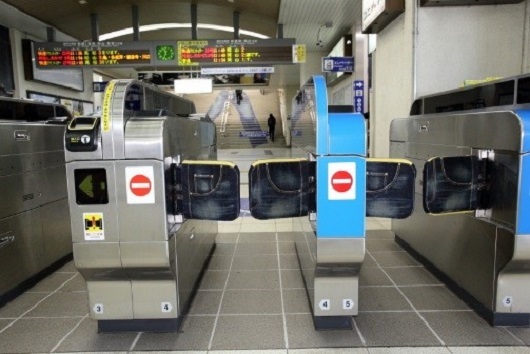 A picture of jeans stretches up the stairway from the platform to the ticket gates. 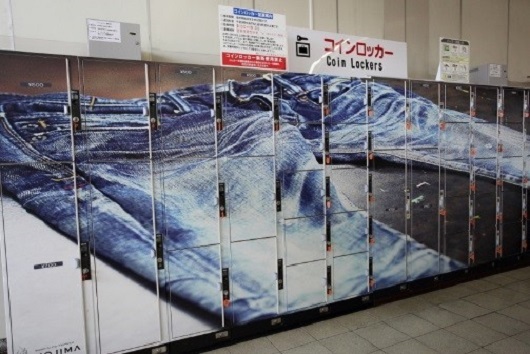 Even the coin lockers are decorated with a huge jeans mural. 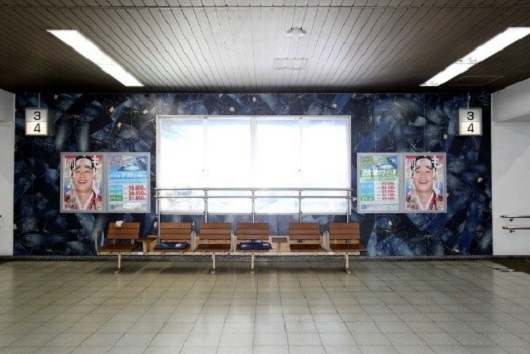 The ticket gates and wall murals all sport jeans patterns. I was over 30 when I entered the textile industry. I'd been a civil servant, managed a coffee shop, built gardens, been a car salesman, and then I took a job in planning and sales of textiles. At first I didn't know left from right, but the more I learned, the more interested I got in cloth manufacture. Cloth is made just by crossing threads this way and that way, but by changing the thread, or the color, or the weave, you can make all sorts of patterns. The result can be completely different depending on the materials. Japan has numerous areas famous for textile manufacturing--Bizen, Bitchu, Banshu, Nishiwaki, Senshu, Hamamatsu, Gamagori, and so on--and the fabric they make is all distinctive. So anyway, my job was to suggest to manufacturers what kinds of textiles to make, as far as weave, color, and design. When the products sold, the fabric from which it was made would sell too. It was fascinating work. I was involved in two projects that had a big impact on society. One was a thick-textured bio-processed rayon. I was involved with trying to find a way to make a fabric like that used for the colored jeans then popular in Europe with a soft texture. I had an inspiration and tried "feeding" bio-enzymes with leftover fluff and we are able to make fabric with a very nice texture almost like silk. It was a big hit. It sold well from the late 1980s to the mid-1990s. Another big hit was when I tried washing Wrangler jeans in used oil to see what would happen. That look was really popular. Like I say, anything is worth a try. After I had been working with that company for six years I founded a textile company of my own in 1992. I had been thinking about what would be at the very core of my company and I decided that I wouldn't handle just anything; I would have a certain specialty or niche. But what would it be? 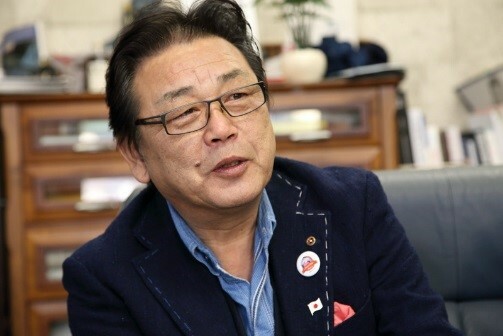 I realized that the secret for success could be denim, which was the local industry of my hometown. So I founded my company with the aim of making my company the best known in Japan--no, the best known in the world--for its denim. If we made genuine denim, it could be the best in the world. I had no basis for thinking it could be done; I just had the confidence that if I tried, I could do it. That's what you call over-confidence! So what is genuine denim, I had to ask myself. It had to be made with the best that could be had of three things: the cotton, the dye, and the weave. At that time, the highest quality cotton was from Zimbabwe, and most of it went to Europe for use in dress shirts. I talked to a wholesaler and asked him to get some of that good cotton for Japan, but he said, "You know it's expensive! If you make jeans from that cotton, they'll be too costly to sell." But, as I said, you don't know what you can do or not do until you try. Ordinarily you decide on the price you want to sell a pair of jeans for and then calculate in reverse, how much you can spend on the cloth, how much for the cotton, and how much for the spinning and weaving. But if you're going to make something genuine, it's not the price of the finished product that matters most; you want to be selective from the raw materials. The same goes for the color. The vast majority of jeans are dyed with chemical indigo dye. But before chemical dyes were invented, it was the indigo plant that was the source of the blue dye. I couldn't attain No. 1 in the world if I didn't know the difference between natural indigo and chemical indigo. So I began working under an indigo dye artist and learned about real indigo dyeing from the ground up--how the indigo plant is cultivated, dried after harvesting, and then fermented in order to make the dye. The color varies depending on the degree of fermentation. Learning about all those things, becoming aware of who was engaged in what painstaking task at what stage of the process, and realizing what dye-makers were thinking about the color--I started to understand indigo dye for the first time. Finally, I thought I could talk about the blue of denim. It is this blue that makes denim so appealing. Japan has 20 or 30 shades of indigo blue (ai-iro) and all of them have names. It was the deeper shades of indigo that I want to learn more about. 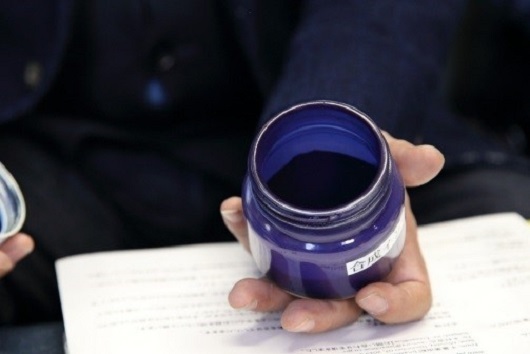 This is the powder of chemical indigo blue. It can be harmful to human health. 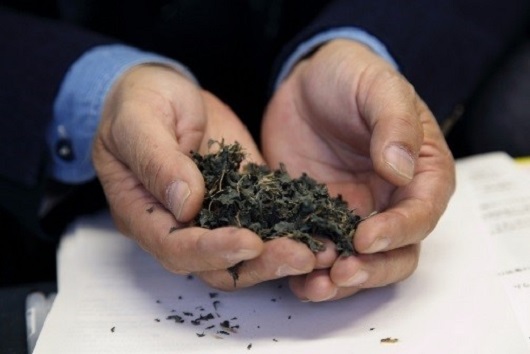 This is the dried leaves of the indigo plant. Only after fermentation does it become a dye. 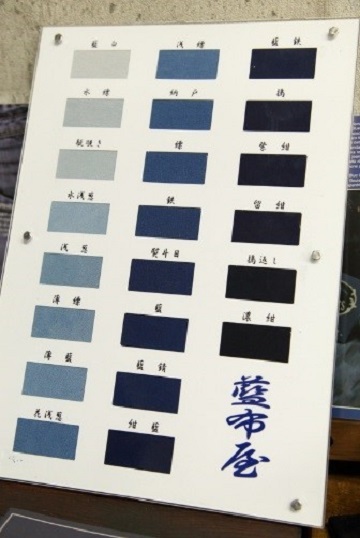 These are the various shades of indigo blue, each determined by the degree of fermentation and the number of times the fabric is dipped in the dye. In 1995, three years after starting up the company, we made Japan Blue Denim, made with carefully selected materials. In 1997 we began to show the product at fairs overseas, as I wanted to find out how my denim would hold up in the estimation of the world. And I was quite pleased at the status it achieved. I have also been showing our denim at an exclusively denim show ever since the show started in 2007. Our product drew a fair amount of attention from the first time. The products themselves were attractive, but the layout of our booth, too, was appealing. We knew that when you're overseas, it's important to make a statement: This is who I am and this is the idea behind what I am making. If you can't express yourself articulately that way, you may be dismissed as an imitator. In 2006 I created our original brand, Momotaro Jeans. For me this was a big turning point. While I had been working with jeans manufacturers as a textile manufacturer, this was the kind of product I had always wanted to make. I had been hesitating for a long time, wondering if it was permissible for a textile manufacturer to produce the final product. By adopting a brand that would evoke our locale (Momotaro is the name of the hero of an old folktale that has been handed down in Okayama prefecture), I had taken a step forward toward establishing the core of my business. 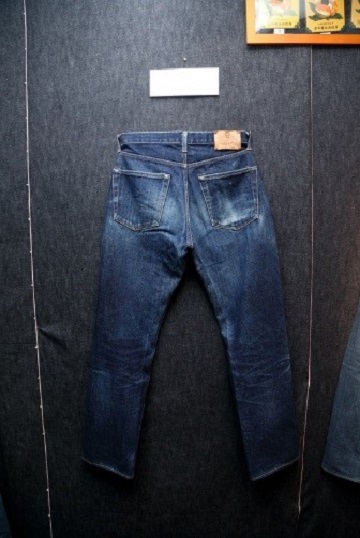 The prototype version of Momotaro Jeans, thus named in order to clearly associate this product with local industry, before the many improvements that we later made. Still, things didn't go smoothly from the outset. The jeans didn't sell and the money kept going out and going out. The staff of our textile division were pretty critical, wondering what on earth their boss thought he was doing. But somehow I was convinced that the idea couldn't fail. I had this unshakable confidence. Finally, in the fourth year, Momotaro Jeans began to sell, and today the jeans division profits have moved ahead of the textile division. We've modified the designs a bit and started to sell jeans overseas as well. They are now selling at more than 100 stores in 26 other countries. I am also quite pleased about the fact that the activities of my own company, despite being aimed at taking on the world, have meanwhile contributed to my hometown. Kojima is now on the map, both in Japan and overseas as "jeans town," and that makes me very proud. I believe that a business should ultimately contribute to the community it is a part of. Since after all, the fact that my own company has won high marks for its products is thanks to the local industry of Kojima, I'm determined to make sure our town keeps its place in history.